Bring Your Info to Your Next Doctor Visit | ExpressWell, Inc. 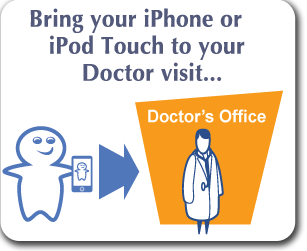 When you visit your doctor, carry your iPhone or iPod Touch with you, and your critical medical information will be at your fingertips. Have you ever arrived at the doctor’s office, only to realize you forgot to bring along the prescription you’re currently taking? Or have you been asked a question on an admission form in the waiting room that had you stumped? Do you get tongue-tied, anxious, or forget things when you speak to your doctor? Having your current information with you is an easy way to skip the anxiety! Just pull out ExpressWell, and you have your own personal information at your fingertips. Remember, this is your appointment, and you should be able to use the time to best treat your needs. ExpressWell simply sets the stage to do that. It’s the starting point of your conversation with your doctor, and it’s a valuable reference tool throughout the visit.